If you own a website, you must be aware of the importance of a dofollow backlink from a high authority site. As we are aware, backlinks are crucial to raising the ranking of a site and drive organic search traffic to the website. Search engines give weight to backlinks while ranking a website; it pushes all SEO experts to create a large number of high-quality relative backlinks to their client-sites. Everybody wants a backlink from a high authority site. 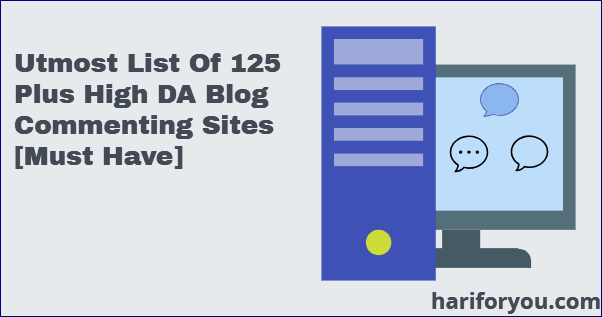 To achieve this, every site admin joins various discussion forums related to his niche, leaves comments on high authority blogs, creates profiles on popular social websites, writes guest posts, etc. 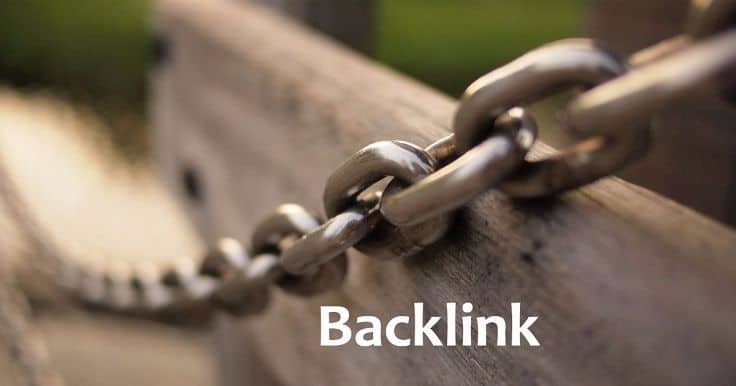 Backlinks are of two types – Dofollow backlinks which carry maximum link juice, and Nofollow backlinks which don’t carry any link juice. Getting a dofollow backlink from a high authority website is difficult. 1. Go to plus.google.com and click sign in button at the top left of the page. 2. You require Gmail account credentials to sign in. If you don’t have one, create it. 3. A new Google Plus page will appear. 4. Click on ‘Profile’ button in the left vertical navigation menu. Once you are on your profile page, you can upload a profile photo and cover photo. 1. Click ‘About’ button on the cover photo and a new screen similar to the one shown below will pop up. 2. Three edit symbols are seen in the display, but you have to focus on ‘Sites’ and ‘Story.’ Click edit symbol against ‘Sites’ and a new window like the one below will pop up. 3. Enter your site name and its link in the appropriate places. If you have more than one website, you can enter them as well. These website links will become dofollow backlinks to your sites. 4. Now click edit symbol for ‘Story,’ and a new window like the one below will pop up. 5. In the ‘Introduction’ area, you have the opportunity to enter one or more links. As you can see, I have inserted two links in this area. Check the link type – dofollow backlink or not? 1. Now we have to check if these links are dofollow or not? I am using Mozbar tool to confirm it. 2. You can use this tool or any other one, and you will find that these links are dofollow backlinks. 3. Congrats! You have got a dofollow backlink from Google Plus — a site with a domain authority of 100. 4. But, there is one issue – You will not find a unique URL for the ‘About’ page to submit to Google for indexing. The URL you see is a general URL for all accounts, i.e. https://aboutme.google.com/?referer=gplus. 5. You can hope Google will consider these links for your site ranking. 6. But, don’t forget to submit profile page URL to Google for indexing. You can get a good amount of nofollow backlinks from Google Plus. These backlinks will help improve your domain authority. 1. Whenever somebody likes or comments your post, a notification is generated. You can find ‘Notifications’ button on your Google Plus home page navigation bar. 2. Click it, and a page with all notifications will appear. 3. Click one notification at a time, and a page will pop up, having a post that was liked or commented. 4. This page has a unique URL, and all the links on the post will be nofollow backlinks. 5. You can insert backlinks in the comment area. The page will look similar to the one shown below. 6. You can confirm the links by Mozbar tool. 7. Now, it is time to submit this page URL to Google for indexing. 8. You should repeat the process for all the notifications. Do not miss this opportunity of capturing valuable backlinks, particularly a dofollow backlink from Google Plus. Make intelligent use of this social site for traffic and link generation. If you want to add something to the above topic, please do write to us in the comment area. He is the founder of Hari For You and blogs on WordPress, SEO, Social Media Marketing and Technology. Moreover, he believes in "Keep the things Simple and Help others to Succeed." This is new tricks for me, Thanks for suggesting simple and easy tricks for create backlinks. I’ll try this. This is necessary information for me that how to get dofollow backlink from google plus. hi hari sir aapke post ko dekh kar maine google plus se dofollow backlink create kiye but wo show nahi ho raha hai . Please help me step by step.. Thanks for your feedback, Manoj. Please email me the snapshot of the link page and steps you took. Please provide me your Google plus id so that I can check and revert back. Moreover, the steps I have written are complete. thanks for sharing information about dofollow backlink …. Aniket, you need to click ‘About’ button on your profile page. A small page with an option to edit ‘Sites’ and ‘Story’ will appear. Then, proceed as per the article. Cool Post, getting dofollow backlinks from a website with Good DA such as Google Plus would help spike rankings. Your tips are really easy to follow! 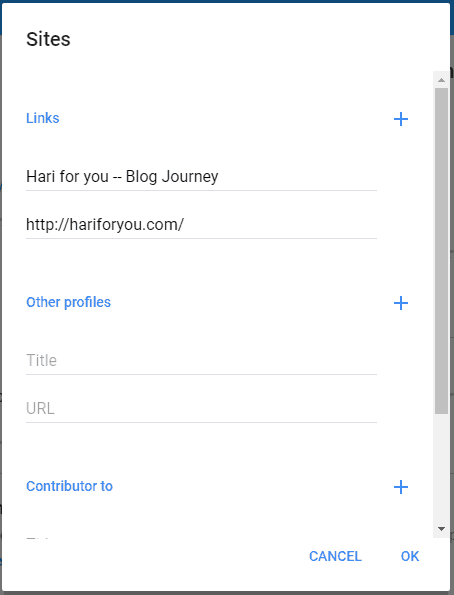 Hi Hari..i followed all the steps..but what is the procedure to submit profile page URL to Google for indexing. And also how to check with mozbar tool? 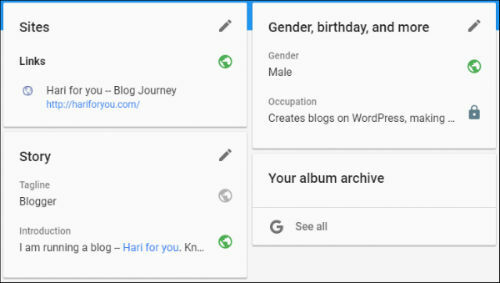 Your Google Plus profile URL will look like this — https://plus.google.com/u/0/111666930888603623303 and this can be submitted as any other page. If you have installed Mozbar tool in your Chrome extension, then click M, then highlight link (pencil like symbol), then followed button. It will highlight the dofollow backlink on this page. I am quite new to this whole SEO..so just figuring it out..Thanks..i will try this..when i made the changes to my google plus account, somehow my social media icon for google plus on the blog is showing 404 error..does this happen usually? Very informative. Thank you so much for sharing. Kindly tell me if I need to index all the website where I leave my website URL or it will automatically index. Thanks, Kumar. You need to index all those page URLs where you leave your website links. Otherwise, it may or may not be indexed by Google. sorry but how can I index websites which I’m not an owner of?? Login to your Gmail account. Then, type – submit to Google – in the search box. Click on the first result and submit the page URL you want to index. This way you can submit any webpage even if you do not own the site. Thank you for sharing google plus knowlege with simple steps. That’s a nice guide i found for getting the backlink from G+. Thanks for such nice guide. This is the best method to get do follow backlinks. Sir How many links can we create in one day, if Any Limit? You should create not more than four-five links per day. Otherwise, Search engines will take it as spamming. As such there is no limit to the number of links you can create per day. How to check whether it is really dofollow?? There are many online tools to check if a link is do-follow or not. But I use Mozbar from Moz – a Chrome extention – to check the links. How to check dofollow backlink? Hi Vishnu! You can use Moz bar extension to check dofollow backlink. Thanks you for a great article. I am using Google plus to get back links for my website. It’s great deal of SEO link juice. It was useful. Honestly @HariMohan most of people dont share this kinds of useful infos these days, so thank you and keep on sharing this kind of goodness. Can I do all the steps with mobilephone? Because, i didnt find the profile as same as your picture above on my G+. Thanks a lot this is a wonderful tip from you. Hope google counts google plus link. Hi, followed the instruction and I did it. but when you said submit to be indexed. where can i submit the url? because i tried from my search console but i can’t because is not my property. Now, Google has removed this option of “Submit url to Google”. Through search console, you can submit only your website url. For other links, you should use ping sites for indexing. Get the most Valuable Websites-List for a blogger & regular updates. 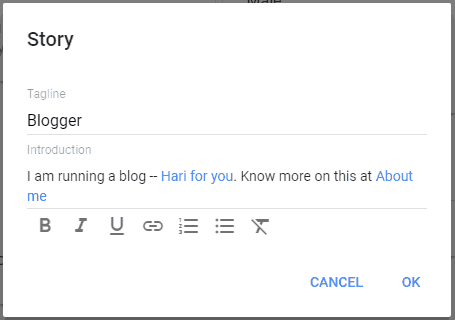 Hari For You Copyright © 2019.